Description: St Bride's is named after St Bridget (Bride) of Kildare, of the 5th century ad, and is the eighth church to stand on this site. 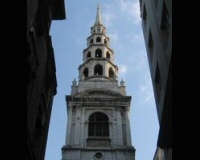 The present church was rebuilt after the Great Fire by Sir Christopher Wren in 1671-78 and was his second most costly church after St Mary-le-bow. The layered spire rises 226 feet and was added in 1701. Originally 8 feet higher until the top was lost in a thunder storm in 1764. It inspired the modern wedding cake, when a local baker, William Rich, modelled a wedding cake for his daughter on the spire. Other bakers soon followed suit and the spire has been known as the 'wedding-cake steeple' ever since. Wartime bombing in 1940 badly damaged it, and during renovations in the crypt the remains of a Roman house were found. These and other artefacts in the crypt museum tell the story of the church. Among the exhibits is a lockable coffin from the 18th century when body-snatching was commonplace. Credits: St Bride's, named after St Bridget (Bride) of Kildare, is the eighth church to stand on this site.